In 15-18 Fiddle competition at Fleadh Cheoil na hÉireann 2018, Senan Moran, CCÉ, Portarlington, Co. Laois, plays a Jig - “The maid at the spinning wheel”. 555.13 From CCÉ, GA, USA, Patrick Finley plays a Jig in Senior Fiddle competition at Fleadh Cheoil na hÉireann 2018 in Drogheda, Co. Louth. 555.14 Cormac Mac Aodhagáin and Emmet Ó Tuathail, CCE, Cr. Bheartla Uí Fhlatharta, Kildare, play a Reel when taking 3rd place in Senior Duets competition at Fleadh Cheoil na hÉireann 2018 in Drogheda, Co. Louth. 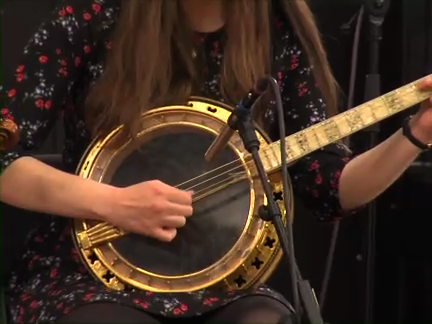 555.15 In Scoil Éigse Tutors’ Concert at Fleadh Cheoil na hÉireann 2018 in Drogheda, Co. Louth, Niamh McGloin, Lucia McPartlin and Elaine Reilly, play a selection of Reels commencing with “Cappataggle shuffle”.